Bad breath is something everyone suffers with at some point. Especially bad in the morning, most people end up brushing the smell out in the morning. But even throughout the day, the bad breath can build up when bacteria builds up on your tongue. The actual bad odors originate from the "waste" from those bacteria. So one way to reduce bad breath is to keep your mouth free of extra food debris after eating. One solution is to rinse your mouth out with water after eating any food. This will dislodge and wash away any loose debris in your mouth. If you have floss, it can help remove food debris stuck between your teeth. But a majority of the bacteria in your both grows on your tongue. Standard Toothbrush - From my experience, a standard toothbrush is good for dislodging the bacteria, but not actual effective at removing it from your tongue. It just kinds of pushes it around. Metal Spoon - Great at removing bacteria, but is my opinion is too harsh. I sometimes end up pressing too hard causing my tongue to bleed. This option requires many strokes to get every corner of your mouth. 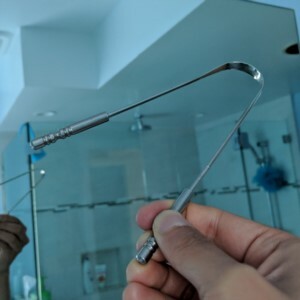 Plastic Tongue Cleaner (view current price and photo) - It's shaped like a tooth brush, but is has a small loop that is effective at collecting removing bacteria from your tongue. However, the loop fairly small, generally around the size of a nickel. The result is it requires many strokes to remove all the bacteria. Repetitive strokes can cause your tongue to bleed. Stainless Steel Tongue Cleaner (view current price and photo) - Find this the most effective way to remove bacteria. It's simple a U-shaped metal device that you use to scrape your tongue. Due to it's shape, it only requires 1-2 strokes to get full coverage of your tongue. The stainless steel claims to be good at repelling bacteria, so if your purchase one of these, make sure you don't buy one with plastic handles! I used the plastic tongue cleaner for 4+ years. And it worked very well. But it's finally starting to not only break down, but the plastic is starting to weaken. Since then, I've upgraded to the stainless steel tongue cleaner. I find this not only more effective, but doesn't cause my tongue to bleed. The downsides of the stainless steel tongue cleaner is that is is more expensive than the plastic tongue cleaner. Also, the plastic tongue cleaner is much easier to carry around on vacation, as it's shaped the same of a toothbrush. However, the stainless steel one is more square-ish. But for day-to-day usage, I'm now a fan of the stainless steel variety of tongue cleaner.